A handy guide to not embarrassing yourself. We’ve all seen it happen. A Facebook post, Instagram caption or series of tweets starts innocently enough, and suddenly your social media “friend” is ranting about Starbucks cups, burning bridges with their own family members or making problematic “observations” while sharing a local news story. Social media gives us all the ability to express our ideas—and our opinions—about whatever we want, and gives us the sense of security of doing so right from our phones while waiting in line at the deli counter. But just because you can say something, doesn’t mean you should. And as the old adage goes, the internet never forgets. Nothing is ever really deleted. So, before you limit your future employment options, deeply offend elderly members of your family or burn bridges with lifelong friends with a single late-night Facebook rant, here are a few red flags to watch out for when posting. If you have to preface what you are about to post with a warning that—despite the forth-coming comments—you are not racist, bigoted, closed-minded (or fill in the blank), then we’ve got some unfortunate news: You’re probably about to write something racist, bigoted or closed-minded. Everyone has their own personal biases, and sometimes social media has a tendency to reveal and then amplify them. Instead of expressing an opinion you feel you have to qualify with how not racist you are, maybe take some time to try and understand why you feel it’s necessary in the first place. Then, instead of lecturing friends on your own hot take—or shouting into an echo chamber of your own making—engage in real, face-to-face conversation with people who see the world differently than you do to challenge your biases instead of just trying to have them affirmed. YOU’VE NON-IRONICALLY LINKED OFF TO A WEBSITE THAT QUESTIONS THE VALIDITY OF THE MOON LANDING. We live in a time when fake news has become a real problem. There are sites and media companies whose entire business models are predicated on completely fabricating current events (Pro tip: Most actual news stories don’t contain quotes about the Illuminati.). One of the ugliest characteristics of the fake news trend is the tendency for conspiracy theorists to turn actual tragedies into click- bait fiction. Don’t let your posts contribute to fake news and the conspiracy epidemic: If you’re linking to an article, make sure the site doesn’t also have content that makes the case that lizard people are running the pop music industry and the body of Elvis has been cryogenically frozen under the Vatican. Not only does it damage your own credibility—it also perpetuates the cycle of misinformation. YOUR POST ATTEMPTS TO DEFINITIVELY DECIDE IF SOMEONE HAS BECOME A HERETIC AND SHOULD THEREBY BE EXCOMMUNICATED. Debating theology can be a fruitful exercise. But if a thread turns from a friendly discus- sion about an interesting book to a Spanish Inquisition-style determination of the eternal resting place of the soul of some blogger you’ve never met, things may be escalating a little too quickly. In AD 325, the Council of Nicea featured weeks of debates between hundreds of the world’s foremost bishops tasked with choosing writing to be canonized as holy Scripture. In 2017, some rando with a Facebook account can declare a leading Christian pastor to be an irredeemable heretic because they didn’t like a two-minute YouTube clip of a sermon. Obviously, there’s a problem here. YOUR PRIMARY ARGUMENT IS MADE IN THE FORM OF A FUNNY PICTURE WITH WHITE BLOCK LETTERS ON IT. As anyone who has mastered the time-honored art of argumentation and the Socratic Method can tell you, nothing will favorably end a debate quicker than a picture of Willy Wonka saying something snarky about Benghazi. It’s the intellectual equivalent of a Mortal Kombat finishing move. If you are going to engage in nuanced de- bates about complicated issues, be respect- ful, thoughtful and let actual dialogue—not sarcasm—guide the conversation. COULD HAMPER FUTURE EMPLOYMENT OPPORTUNITIES. Here are a few questions you should ask before posting that “hilarious” picture you snapped during a church retreat prank, a late night during summer vacation or while wear- ing what you now realize was a problematic costume to a Halloween party: Will posting this give the next business/nonprofit/church/ school that wants to hire me any pause? If so, maybe just keep this one on the camera roll. Look, showing up as “Adam” in an extremely/unsettlingly realistic flesh-colored bodysuit and a single fig leaf seemed like a funny idea at the time, but your future HR department may think otherwise. Use Facebook to grow in your faith, not just to try and disprove others’. 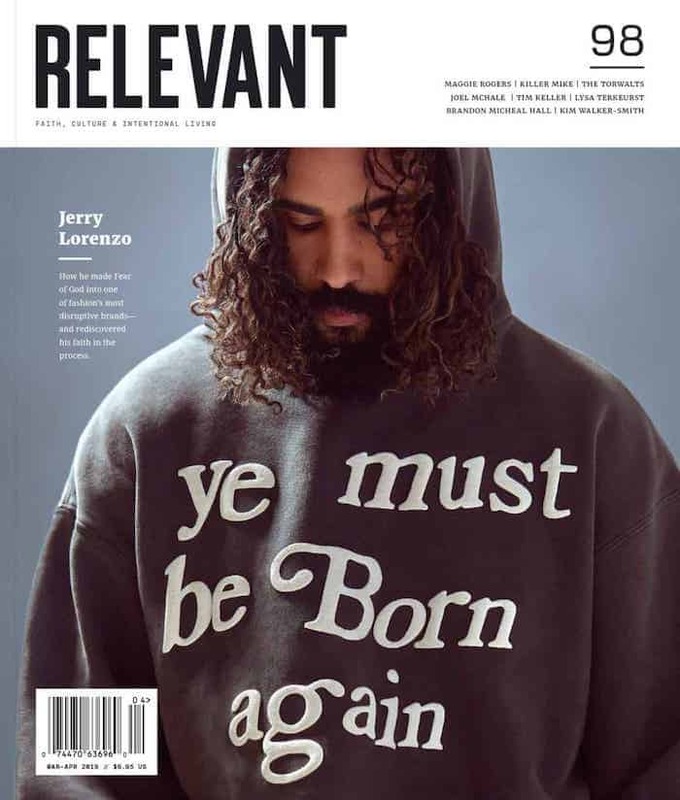 Jesse Carey is an editor at RELEVANT and a mainstay on the weekly RELEVANT Podcast. He lives in Virginia Beach with his wife and two kids.